Half an hour’s drive from downtown Buenos Aires lies the marketplace and scenic views of El Tigre – Buenos Aires’ riverfront getaway. Once the summer home to the city’s elite, El Tigre boasts an open air market, colonial homes, and a glamorous hotel-casino. Families flock to the fruit market for crafts and household goods like furniture and decor. I was itching to visit the riverfront I’d heard was so pretty, and I got finally the chance to see it for myself. 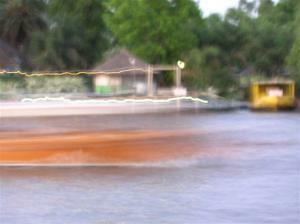 I went with a group of locals to shop, eat and watch the boats pass by over a glass of malbec at sunset. 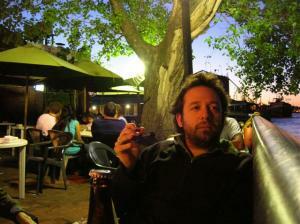 The boardwalk of cafes was relaxing and scenic with a ferris wheel in the backdrop and a canopy of trees overhead. Along the way to El Tigre we stopped in San Isidro to sample the parilla and shop for antiques. San Isidro is a charming town of tree-lined streets and beautiful homes. I made a mental note to investigate the option of this kind of suburban life in my future. There were houses full of antiques for sale spilling out into gardens like permanent garage sales full of splendid finds. We passed another town called San Fernando and finally arrived at the Mercado de Frutos. The Mercado de Frutos, also known as the Puerto de Frutos, is a local crafts and produce fair with wood and woven furniture and household items, gifts, and locally grown fruit and vegetables. 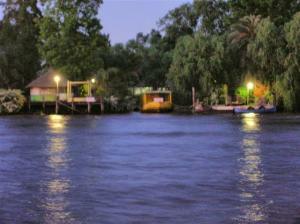 There are indoor and outdoor shops and restaurants all along the river Tigre. The surrounding town includes colonial homes and a historic hotel-casino. It’s the perfect getaway! This page rendered in 0.529 seconds.